Join us on Friday, April 27, 2018 for an afternoon with the latest and greatest startups Austin has to offer. From 1 pm – 5 pm, 16 of the best Austin startups will present their business plans at our bi-annual TVL Venture Expo. The event will be followed by a networking reception from 5:00PM – 7:00PM. We look forward to having you here at #VentureExpo! Registration is free. Click here. To learn about Texas Venture Labs please visit: http://bit.ly/TVLVentureExpo. The TVL Accelerator matches Austin-area startups with cross-functional teams of UT Austin graduate students for 10-week long startup consulting projects. Our rigorous market validation process and our students’ research accelerates startups towards funding. 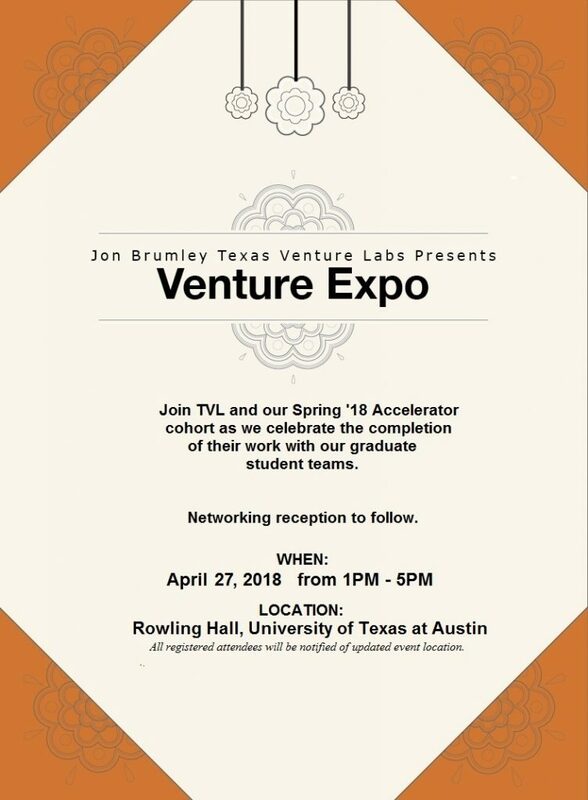 At the end of the semester, each Accelerator company is offered an opportunity to present to Austin’s investor community at our capstone Venture Expo event. Interested in applying for the Fall 2018 cohort? The application is open now. Deadline to apply is July 15, 2018.